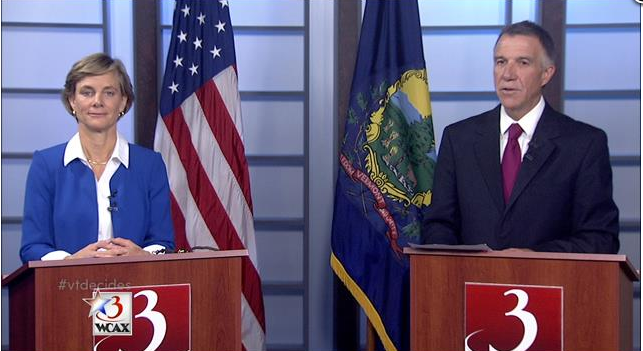 Democrat Sue Minter and Republican Phil Scott face off in a gubernatorial debate Tuesday night. Given the chance to challenge each other, the two major-party candidates for governor didn’t hold back Tuesday night in a debate aired on WCAX-TV. But even pressed directly by their opponents, both candidates still managed to avoid answering some of the questions. “Are you ready to admit that adding a sales tax on services is a really bad idea?” Republican Phil Scott asked his opponent, Democrat Sue Minter. “I will not increase sales on services that burden middle-class Vermonters,” Minter replied. She highlighted her proposal to levy a sales tax on lobbyists, private jets and limo rides. But, as in the past, the former transportation secretary did not explain how she would differentiate which services are used by middle-class Vermonters and which are used by the wealthy. She, in turn, asked Scott how he was going to pay for tens of millions of dollars in proposed tax breaks that she argued would benefit the wealthy. “How are you going to balance the budget while giving tax breaks for the wealthy and corporations?” she asked. Scott, co-owner of a Middlesex excavation company and lieutenant governor for the last six years, responded by saying the time is overdue for government to live within its budget. He didn’t address how he’d fund proposals he’s made, such as research and development tax credits. Minter, 55, of Waterbury, and Scott, 58, of Berlin, are competing in the November 8 election to replace Democratic Gov. Peter Shumlin, who is not seeking reelection. Both candidates lobbed accusations against the other during the hourlong debate, which featured a segment where the two candidates could direct questions at each other. Minter declined, however, to give a straight answer on whether she would veto a carbon tax bill if the Legislature were to send her one. “I will see what it is they’re talking about,” she said. Scott said he would veto such a bill. Minter repeatedly tried to tie Scott to Donald Trump, his party’s presidential nominee, though the lieutenant governor has long denounced Trump. “Do you stand with the Vermont Republican Party or do you stand with Vermonters in being appalled by the talk of Donald Trump?” Minter asked. Scott, who has insisted that Liberty Union candidate Bill Lee be invited to all debates, argued that including the third-party candidate was worthwhile so voters could hear all perspectives. Voters are drawn to Lee simply because he played for the Boston Red Sox, Scott said. “I think it should be more than that,” he added. Lee wasn’t included in Tuesday’s debate but has attended several others — at which he’s delivered off-point zingers. Scott then accused Minter of ducking debates earlier this year in Grafton and Irasburg, where he said wind-power opponents would have made the pro-wind candidate uncomfortable. “It’s just a coincidence?” he said. Minter insisted she missed the Irasburg debate so she could be in Bennington as water contamination issues arose. “There was a crisis that needed a governor to be present,” she said.